Don’t run away. Please. I know sauerkraut sounds scary (actually, I have always loved sauerkraut, so I’ve never thought it sounded scary, but I know it’s scary for a lot of people.) What I have here before you today is the moistest, most tender, most flavorful pork roast, not too sweet, not to sauer (see what I did there? ), high in protein, low in calories, and a dinner that every single person in my family, including my pickiest eaters, will gobble up every single time. My parents and older brothers and sisters had a whole life before I came along–my closest sibling is 10 years older than me, so all of the backpacking trips, the whitewater river trips, that time they lived in Europe for a year–all that happened before I was born. By the time I came along, my parents were tired and basically gave me free reign of the house and went on trips by themselves while I stayed home with my teenage siblings. So anyway. Back to that whole Europe thing. My dad was a university professor who took a sabbatical for a year and they lived in Germany. So when I was growing up, we ate lots of German fare. Sauerkraut. Various sausages. Sauerkraut and sausages together (in fact, sauerkraut and sausages was the first meal I ever learned how to cook by myself). Sauerkraut and pork. You get the idea. 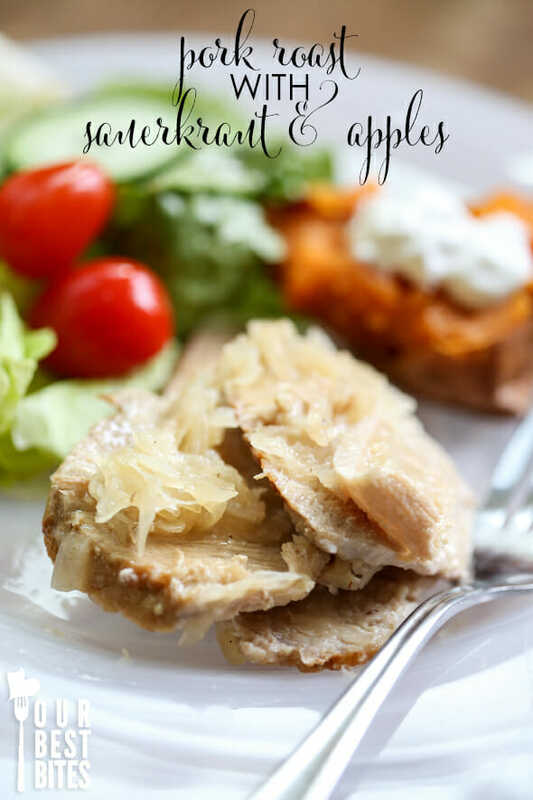 I had completely forgotten about sauerkraut pork until I recently stumbled across this recipe and the memories of this particular dish were so overwhelming. I was worried it wouldn’t taste as good as I remembered it or that it would just be different, kind of like going back to visit your hometown and realizing it doesn’t really feel like home anymore. It was awesome. It was so easy. My house smelled amazing. Everyone ate every bite and asked when we could have it again. I served it with loaded baked sweet potatoes and green salad and it was just the kind of meal that you eat and you feel like your body is thanking you for doing something nice for it. You want to start by heating 2 tablespoons of butter in a large skillet over medium-high heat. Sprinkle a 3-lb. (approximately) pork loin roast (loin, sirloin, tenderloin, whatever) with kosher salt and freshly ground pepper. Place the roast in the hot skillet and brown on all sides. Place the roast in a Crock Pot. and combine the ingredients in a large bowl. 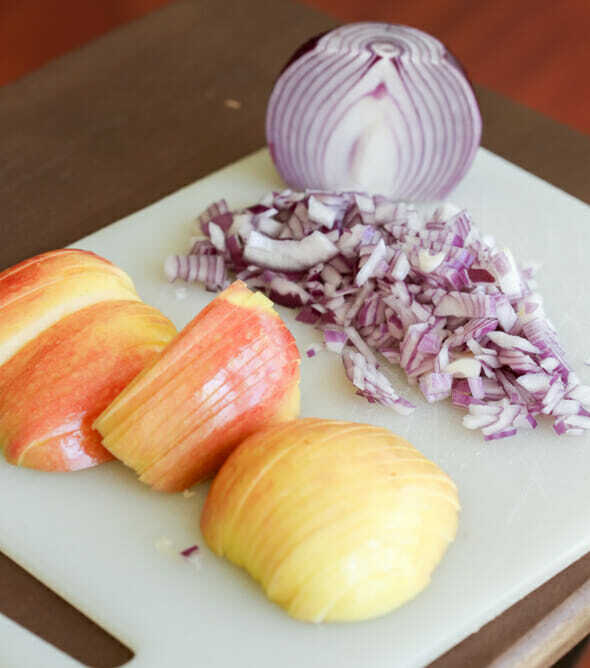 Add in 1 medium sliced apple and 1/2 of a chopped onion. and cook on high for 4-5 hours or on low for 6-8 hours or until very tender and flavorful. 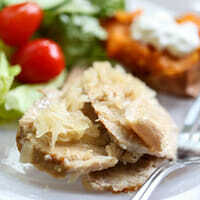 Shred or cut into slices and serve with lots of the sauerkraut mixture on top. It’s great with potatoes (mashed…baked…scalloped…however you like ’em!) and a green salad or steamed vegetables. Makes 10-12 servings. Melt the butter in a skillet over medium-high heat. 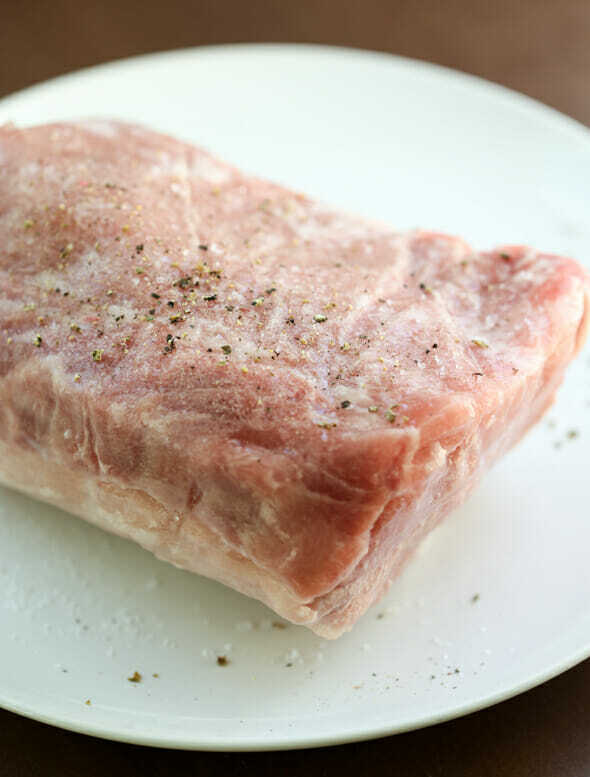 Sprinkle the pork roast with salt and pepper on all sides, then brown it on all sides in the hot skillet. When the roast has been evenly browned, place it in a crock pot. 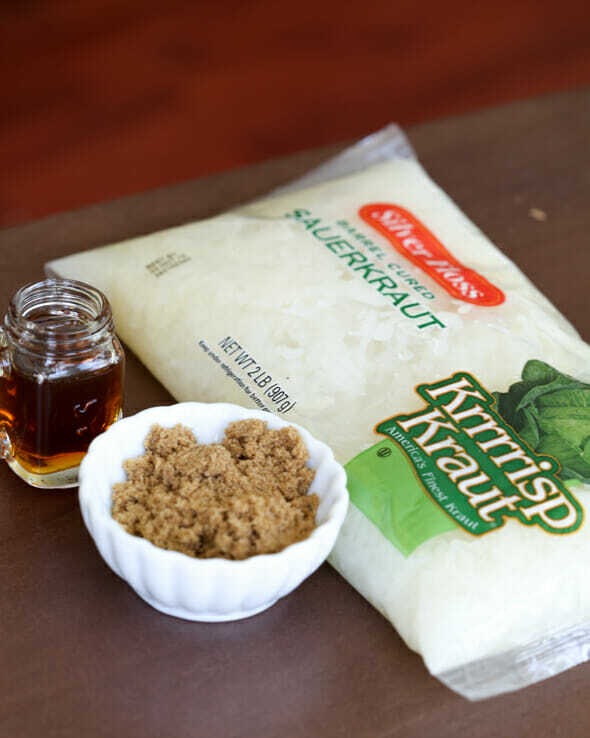 In a large bowl, combine the sauerkraut, chopped onion, sliced apple, maple syrup, and brown sugar. Spread it evenly over the pork roast. Cover and cook on low for 6-8 hours or on high for 4-5 hours (or until the meat is very tender and flavorful). Shred or slice and serve with plenty of the sauerkraut mixture on top. Serve with your favorite potatoes and a green salad or steamed vegetables. Makes 10-12 servings. This sounds interesting. I should try it sometime. For some reason I always thought sauerkraut was some sort of fish… Never tasted it because I always thought it was fish haha. I finally looked it up and found that it’s pickled cabbage. My goodness. My sibling and I are 12 years apart. Pretty weird. We were always in different worlds but we both get to experience being “the only child” though. Okay, I’m dying! You are my Noelle! My husband is a professor…we did a sabbatical for nearly a year in Germany with our 5 older kids and then came home last year and had another baby(Noelle) after a big gap. I feel bad that we have so many fantastic family memories without her. I don’t know you, but you seemed to have turned out okay, so maybe I’ll stop worrying 🙂 And this recipe looks amazing! Maybe this sounds dumb, but I guess I don’t know a lot about mustard. Brown or course grain, is that dried mustard like you find in the spice section or in a bottle by the condiments? It will be (More than likely on the top shelf) but right around the rest if the mustards! You may also want to try the mild hot & spicy mixed with yellow to tone it down as a dipping sause for a fresh Corned Beaf, cabbage, carrots, onions, potatoes & shrooms boiled or Crockpot cooked dinner… the mustard mix is awesome to dip the meat in. 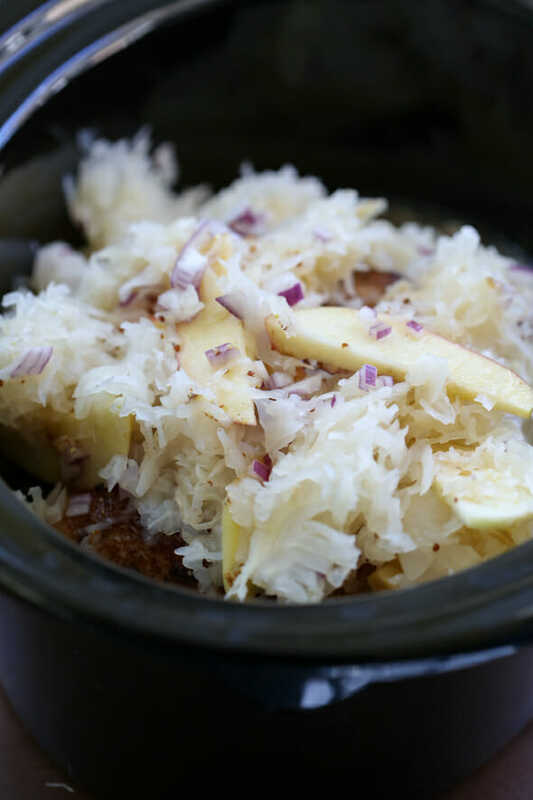 I have a good feeling about this one … My husband loves sauerkraut and I’ve always been intrigued and I love a Sunday dinner in the crock pot that everyone in the family will eat. Looks like a win-win thanks for the post! totally going to make this. I love sauerkraut so much! Sounds interesting! So excited to try this. We always had sauerkraut and pork for good luck on new year’s growing up. A dinner recipe! With a crockpot! And it’s healthy! 🙂 These types of recipes are what I visit the blog for. Thank you!! We love sauerkraut! I grew up eating it – hubs never had it until I made it for him after we got married. I like to use country style spareribs. Not as healthy as pork loin, but delicious! I recall my mom making it with pork sausages sometimes, it was always country style spareribs or sausage. I love it either way! Do you have a favorite sausage you like to use? The best sauerkraut i have ever eaten is homemade; i had an older girlfriend teach me how to make it 5 years ago…and it is the absolute best. I grew lots of cabbages and have a 2 crocks- It’s labor intensive, but it puts the canned/jar stuff to shame..i love putting it also on country style ribs or a pork roast in the crock pot! or making reubens. i will have to try this type you recommended to compare. We just tried a great german restaurant not too far from where we live and it was amazing. My first German food experience and dang it was good. There was even a live band in lederhosen. I am so trying this. Perfect meal for 1:00 church! I hate 1:00 church. Thanks for this one Kate! I’m nuts for sauerkraut and ate it with dinner three times last week! Oh, gosh, I may have to sneakily make this for myself tomorrow while my husb is out skiing since he won’t even go near sauerkraut (or anything else that isn’t chicken noodle soup, fish sticks or other toddler food), so do you think I’d be okay freezing some? I’d hate to try it and end up with a plate of mush when I thawed it out. Just thought I’d check. Thanks! Yum! I love pork and sauerkraut. I have memories of the dishes my Nana served, and my mom and aunts sucking on pigs knuckles cooked in kraut. I never had the nerve to try them myself, but now I have some in my freezer and am working up the courage to cook them. Katie–despite your lack of overseas adventures & river trips, you turned out amazingly well! You’re an awesome little sister & I’m grateful you’re so willing to share your talents! I served my mission in Germany, and I LOVE sauerkraut! I usually cook it with bratwurst (the turkey kind) but it’s also good with smoked sausage (the big ring kind or little smokies). I always brown an onion and the sausage first, then add the sauerkraut, apples, a little chicken broth, and let it cook long and slow. Bay leaf and juniper berries add an authentic flavor, as well. It’s so good! I can’t wait to try it this way! And if you can’t find the fresh sauerkraut, buy the canned and rinse it to get rid of the canned taste. I hope lots of readers will be brave enough to try your recipe!!! Thanks for another great one! Mmmmm, this brought back memories of returning home from church on a Fast Sunday and smelling this cooking in the crockpot. We knew our hunger would end in the most glorious of ways. I can’t even remember the last time I tried sauerkraut, but your pictures of this are making me drool. I even have a pork roast in the freezer. It’s a shame I already did my last shopping trip of the month. I’ll be sure to buy some sauerkraut next month! My dad was born in Switzerland, and we had sauerkraut all the time when I was growing up too. We ate the sauerkraut my grandmothe made. And you are right – canned sauerkraut is not the best. This recipe souns so good and I can’t wait to try it. I made this recipe last night and it was delicious. I made it with pork tenderloin and served it with potatoes and green beans. The bagged sauerkraut is much better than the canned. Thanks for a super recipe! Thank you for this recipe!! I made it last night and my family loved it. Thank you for another fantastic recipe that my kids will eat. I am sorry to report that we did not love this. I wasn’t sure how I felt about sauerkraut before this but I know now. Not a fan. The pork was amazingly tender and moist but the sauerkraut mixture was not a flavor I enjoyed. But seriously, my first disliked meal after years of using your recipes, you guys are still my favorite. How do you cut your apples so perfectly thin and uniform? Do you just have amazing knife skills or do you use a tool that does it for you? My knife skills need some serious work! I am searing my pork right now! But doesn’t your butter just burn when you cook it on medium high? I just threw out my burned butter and started over with canola oil. Am I missing something? Similar to what I do, only I add caraway seed and don’t use the maple syrup, but double-up on dark brown sugar (as it has more maple syrup in it) and two apples.